The 'Scratchpad' tool allows you to run experimental Java Script code on a page. You can try out various ideas and execute them on the web page before final implementation. Some of the uses of 'Scratchpad' include testing new code, debugging, and to run saved reusable java script code. The 'Scratchpad' editor will open. This contains some brief information about how to use it. Run - Executes the code in the page. Inspect - In addition to executing the code in the page, an object inspector will be displayed that will help you to analyze the returned value. Display - After executing the code in the page, the results are inserted in the Scratchpad window as a comment. This will help you to keep track of the changes made in the page. Run	- Executes the code in the page. 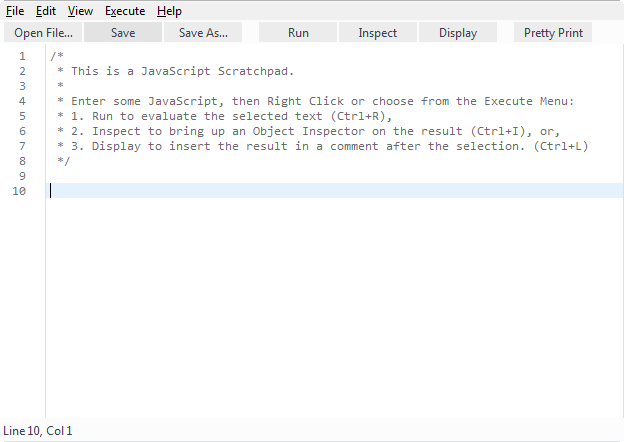 Display	- After executing the code in the page, the results are inserted in the Scratchpad window as a comment. This will help you to keep track of the changes made in the page. Pretty Print – Allows you to print a code.